Answer: There is no single identified cause of vitiligo, except for autoimmunity. Vitiligo is an autoimmune disorder in which the systems in the body that fight off infection begin to fight off the healthy cells (melanocytes) that control the coloring of skin, hair, and mucous instead. Generally, vitiligo first shows up after a triggering event, like a cut, scrape or bruise to the skin. It’s is the stress response to the triggering event that directly causes vitiligo where the immune system mistakenly kills the cells that create pigment. About 20% of people who have vitiligo know that someone else in their family has or had it. People who have vitiligo often say they notice it spreads during periods of emotional stress or after sun exposure. Vitiligo can spread after other damage to the skin like cuts or abrasions. For most people, vitiligo spreads over time to new places in the body and this can occur unexpectedly. 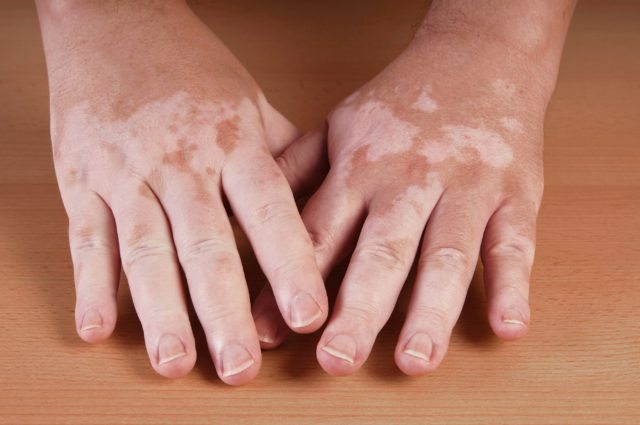 What is autoimmunity and what does it have to do with vitiligo? So what can be done about vitiligo? There is a range of vitiligo treatments which I talk more about here. The medical approaches to vitiligo all include dealing with the symptoms of the disease, not the underlying causes of vitiligo. But the most important thing to deal with is the underlying causes of vitiligo because vitiligo is an autoimmune disease, where the immune system is malfunctioning. This is a systemic issue, and for 25% of the vitiligo population, another autoimmune disease will manifest. Multiple Autoimmune syndrome is not uncommon in western countries. Without dealing with the root causes of vitiligo, a steady progression of the disease is likely. I talk more about the route I take and why, having tried the medical approach, which almost worked. Ultimately, because of time, cost and potential side-effects and long term nature of the disease, the medical approach could not work for me. I needed an approach that didn’t just manage symptoms and surface issues like skin repigmentation. I wanted lasting changes. Changes that reverse the progression and repigment the skin and reduces the chances of further chronic disorders. All of this is possible with a holistic approach that is specific to the individual needs. Curious to know more about what’s working for me? Sign up for the webinar or the email list to learn more.